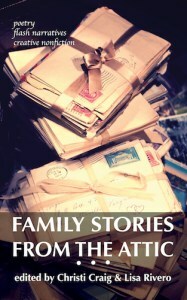 Family Stories from the Attic is an anthology of essays, creative nonfiction, and poetry inspired by family letters, objects, and archives. Nearly two dozen contributors from the United States and Australia tell stories of immigration and migration, loss, discovery, secrets, questions, love, and the search for meaning and identity. I had such a wonderful time meeting all my co-contributors and editors in person, and spending time with my brother and family, and getting to travel, and be in a big city. I did manage to have a panic attack--which I am mentioning as part of the Mental Health Month aspect of this letter writing project. Learn more about panic attacks here and here, and some of the ways to manage them here and here. 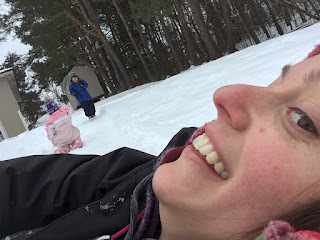 With help and some determination, I did push through it and get to the other side in what I would describe as my best handled panic attack yet. If I'm going to have panic attacks, which I accept that I am, all I can do is try to get good at them. I love to hear about your personal goals and challenges that you are setting. For me, it is actually not mentally healthy to set an everyday goal! I will start to feel that if I don't complete my goal, then I failed entirely and I will never be able to start over again so I might as well quit, yada, yada, yada. Also, the stress of HAVING to do something even if I don't want to makes me kind of miserable. Do you have feelings like this? How do you deal with them? Oh! So interesting. I can see how an approach like this would lead to bad feelings. I guess my overall guideline of "perfection is not allowed, practice is!" is my go to if I start to feel like I'm pushing it to extremes. Like, I was tired last night so I chose a haiku for my poem. I wrote two letters early one morning to catch up for the one I neglected to write yesterday. These slips would, in the past, make me get down on myself. But now I see the heart of the project as something more, and I give myself a reasonable buffer for it. I try not to "should" on myself. I looked up a training for a 5K, and it's pretty reasonable. I'm going to take it as a suggestion, and not a "must do as stated". I'm one who likes to follow my whimsy, so a bit of outside accountability, guidelines, helps keep me acting on my goals. If I slide, I am learning to forgive myself. And I am learning as I go. I'll remind myself not to be too hard on myself if that comes up. Thank you! How about you? Any go-to tactics to overcome the "shoulds-or-else" voice ?